Got an email a couple days ago from Andre Durand saying it was great to see VRM making the cover of the May 2010 edition of CRM Magazine. Well, “cover” doesn’t cover it. Seems like about half the magazine is devoted to VRM, or to what Cluetrain (which in many ways begat VRM) still says, ten years later, about the independence, autonomy and centrality of individual human beings to the workings of a healthy marketplace. V Is for Victory—But the Victory Isn’t Yours. The V also stands for vendor— as in vendor relationship management, which argues that customers are the ones in control of their relationships. By the Editors of CRM Magazine. It’s Not Your Relationship to Manage. Just as you finally come to grips with CRM, the customers themselves have turned the tables—and now they’re managing you. by Lauren McKay. Manifestos Are Conversations More than 10 years after upending the balance between companies and customers, the authors of The Cluetrain Manifesto reflect on its creation—and its lasting influence. by Joshua Weinberger. This is a Big Deal. The original motives of CRM (Customer Relationship Management) were good ones, but far too much of CRM’s use by companies today is unfriendly rather than friendly to customers. The language is a give-away. Customers are “consumers” that companies “track,” “target,” “acquire,” “lock in” and “manage” as if they were animals or slaves. Not that CRM pros are bad people or slave-drivers. (Quite the contrary: all the CRM people I know are fine folks.) Just that with CRM, relationships tend to be under the control of the vendor rather than the customer. With VRM, customers are in charge of their sides of relationships with multiple vendors in the connected retail environment. Once this becomes real, the whole system — and the marketplace with it — changes. And it won’t change unless VRM and CRM work together. As the techies put it, we need AND logic, rather than OR. The good folks at CRM Magazine see that. And for that we owe huge thanks to Tara Hunt, who made the original connections with CRM Magazine folks, and started conversations that fanned out to include many other folks doing good work in the VRM community. So, a big thank-you to her. Also to CRM Magazine for having the curiosity, vision and guts to look seriously at VRM and its development efforts — and to everybody in the VRM community for playing a part. Lots of good work going on. Let’s keep it up. Great post and we couldn’t agree more. Putting the relationship in the hands of the customer and community is the driving force behind open source CRM, and I think the reason why SugarCRM has become so popular. Check out this post from non-profit StoryCorps about SugarCon http://blog.techsoup.org/node/1289. Thanks, Nick. Great to see you here. Been a long time. Good pointer also to the SugarCon item. I had been invited to speak there, but there were scheduling conflicts and it didn’t work out. Maybe next time. Vendor relationship management is really rallying the human factor into the business environment where the customer gets an extra hand over management issues and control. Is this just something trending? Or has the industry totally veered towards the customer taking the reins? 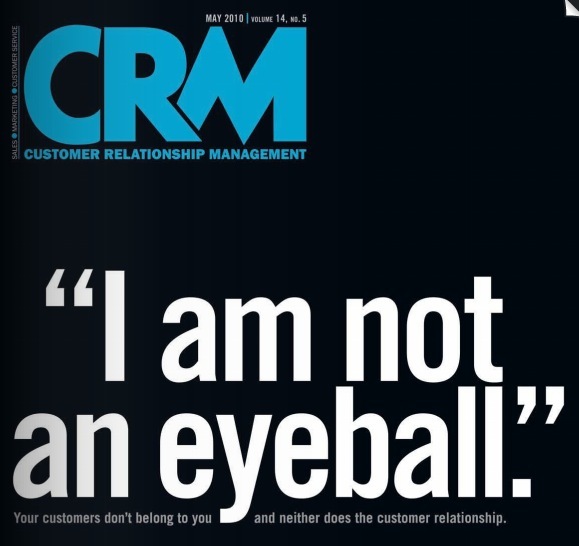 Should I be wary now that CRM magazine has strategically placed VRM on its cover? This shift is indeed interesting to keep an eye on.